Prison officials at Corcoran State Prison, roughly 150 miles from Los Angeles, have released an updated photo of notorious convicted murderer Charles Manson, along with the statement that he has his own cell (versus sharing) in their protective custody unit. He is also currently in good standing, after having some disciplinary issues in the past, and is in good health, a bit of ironic good fortune seeing as to the current medical condition of his once-devoted follower Susan Atkins. 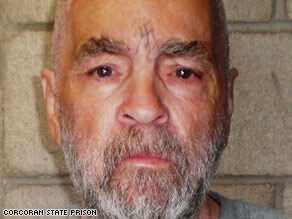 For many people, myself included, seeing this recent photo of Manson is a shock. In stark contrast to the infamous 1969-1970 photo of a wild-eyed, monstrous looking Manson that branded him one of the most notorious convicted felons in the United States, this most recent photo shows Manson looking old and almost feeble. Certainly not the mastermind behind a drug-induced plan to create a "Helter Skelter" racial war. But he was, no matter how old he gets. Manson is exactly where he belongs. You know, we are coming up on the 40th anniversary of the murders. Forty years that Manson has had that he denied his victims - - musician Gary Hinman, student Steven Parent, hairstylist Jay Sebring, Voytek Frykowski, coffee heiress Abigail Folger, Sharon Tate Polanski, her unborn son Paul Richard Polanski, Leno LaBianca and Rosemary LaBianca. And let's not forget his surviving victims, as well - - the families of these individuals who had to pick up the pieces of their families and their lives and try to go on after losing a loved one in such a brutal, vicious way. The officials at Corcoran also stated that Manson continues to receive a lot of mail, as well as requests for visits, which baffles me. What could he possibly have to say, or offer, that would be of any interest to anyone? He is nothing more than a con man - - using a bunch of dropouts and drug addicts to commit murder for him, under the pretext of an imagined race war, all because he wanted to break into the music business and felt short-shrifted. Because Manson didn't get his way, nearly a dozen people had to die and innumerable families were torn asunder. 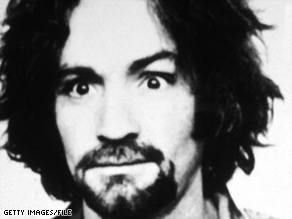 For what it's worth, Manson's next parole hearing is scheduled for next year. As he did not attend his 2007 hearing, it's doubtful he will attend the one next year. At least he is serving his time now, relatively quietly, without the assertions of new found Christianity (Atkins and Charles Watson) or pleas for compassion (Leslie Van Houton and Atkins).